Long hot summer and ice cream van’s are something a lot of people remember from 1976. This was the year the UK had a long heatwave and the hottest summer since records began. The ice cream van turning up outside your house was a very welcome treat during the severe drought and soaring temperatures. I was contacted by Wall to Wall television who make award winning television programmes around the world. They have also made a number of much loved returning series including Who Do You Think You Are?, The Voice and The Edwardian Country House. They made the living history series Back in Time for Dinner last year about a British family embarking on an extraordinary time-travelling adventure to discover how a post-war revolution in the food we eat has transformed the way we live. Wall to Wall television asked me if I would take part in the filming of their new series called Back In Time For The Weekend. It would show a family giving up their 21st-century technology and travel back in time to discover the radical transformation of our leisure time since 1950. 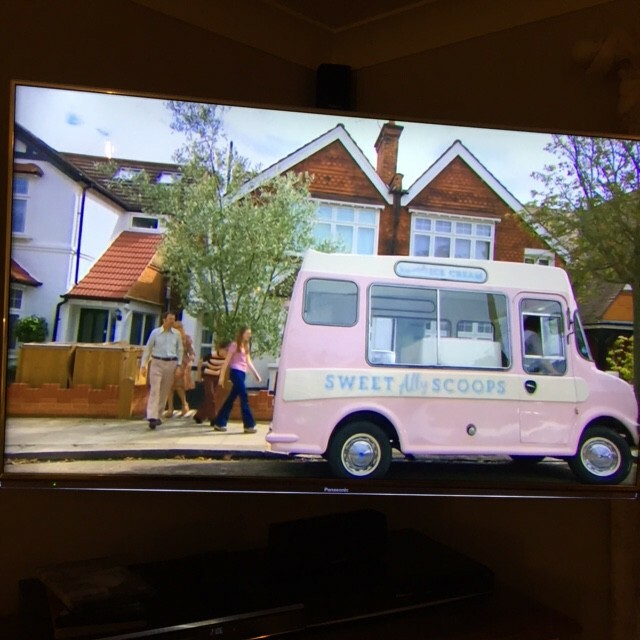 I was asked to take Lottie along to be part of the clip for the long hot summer of 1976 as Lottie was built in 1973 and her shape is iconic of the ice cream vans during the 1970’s. Filming was lots of fun, mostly because it had rained during the morning and we had to wait for the pavements to look dry. The location was also below the flight path which meant getting a take in quickly before a plane flew over which made for an unhappy sound man! I also had to manoeuvre Lottie into a small space between a skip and a car and stop on an exact spot. Not easy without power steering! 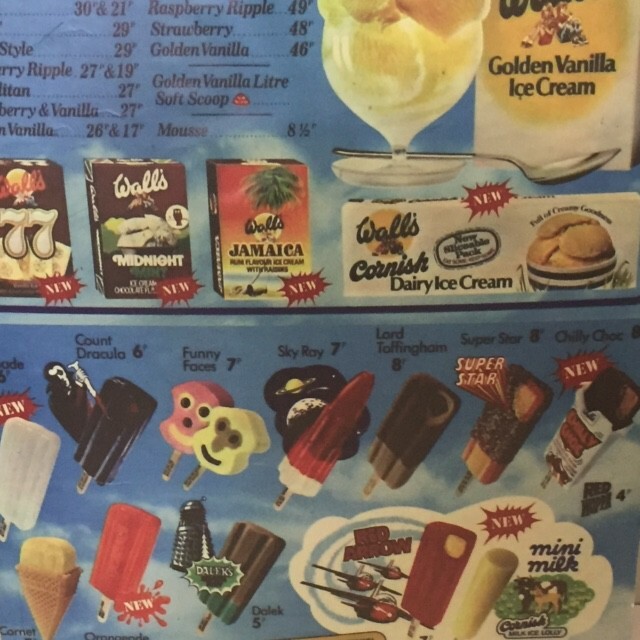 The production team had made up a poster advertising all the iconic ice creams for sale during the 70’s. I would have been eight years old in 1976 and so I remember all the lollies and ice cream really well. I loved the red arrow lollies and for only 7p! No organic gelato in 1976! The Ashby-Hawkins family were fun and really lovely as were all the crew. Lottie did really well driving up to London and back but boy was I pleased to get back to the quiet Fen roads! You can see the snippet of Lottie on my Youtube channel. © This website and its content is copyright of Sweet Ally Scoops 2016.